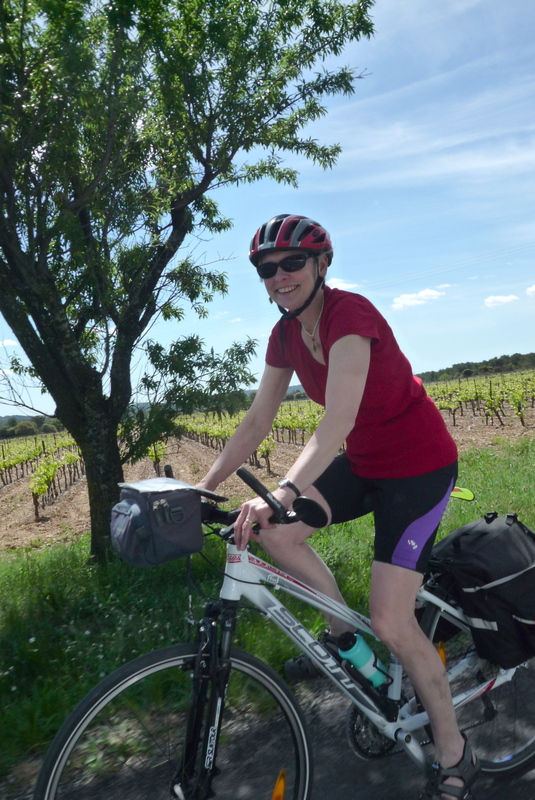 A few months ago I got an email from a very enthusiastic Anne, who had heard about me from Suze, a blog buddy and generous contributor to my other site, Cycling Languedoc. Anne and her husband David, it turned out, were looking for a self-guided tour in Le Sud, but couldn’t quite find what they were looking for. Suze suggested that they contact me and see what we could come up with. I had tossed around the idea of organizing self-guided tours before (these are bike tours without the guide, but usually with route maps, accommodation, bike rentals and baggage transfers included), but had never pursued them, so it was excellent timing to receive such interest from two veterans of this type of thing. We traded emails back and forth for weeks till everyone agreed on a tour of 7 days, starting and finishing in my old hometown of Montpellier, and taking in many of the same great roads I used to roll along when we lived ‘out west’. 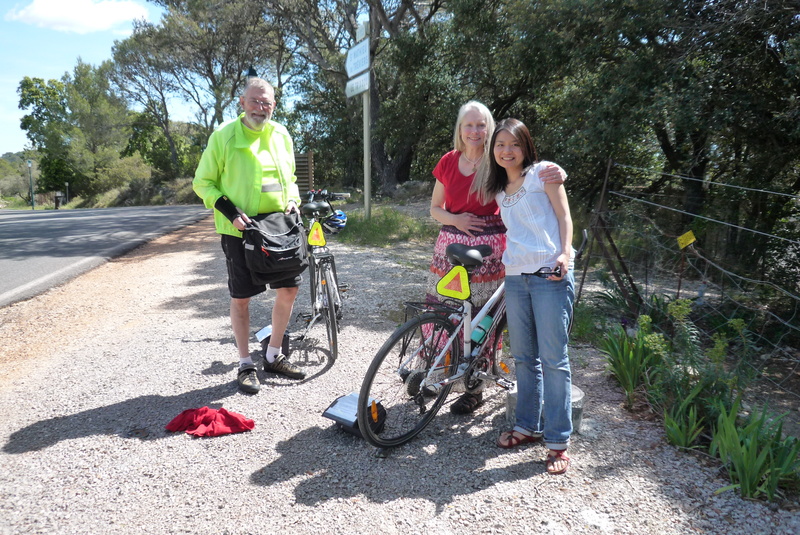 Here are David and Anne, along with my lovely assistant, Shoko, on Day Three, when we transferred their bags to their destination of the day – St. Guilhem le Désert. We unpacked the ‘rental van’ (thanks John! ), made sure the sunscreen was packed in the saddle bags, and said our goodbyes. Then a horse walked by. 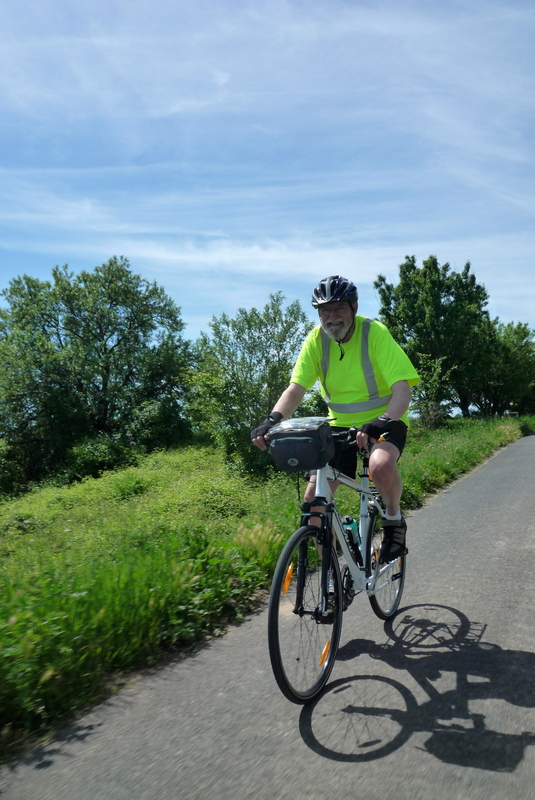 THEN we said our goodbyes, and they rolled down the slopes of St. Jean de Cuculles. But we were going the same way, actually. 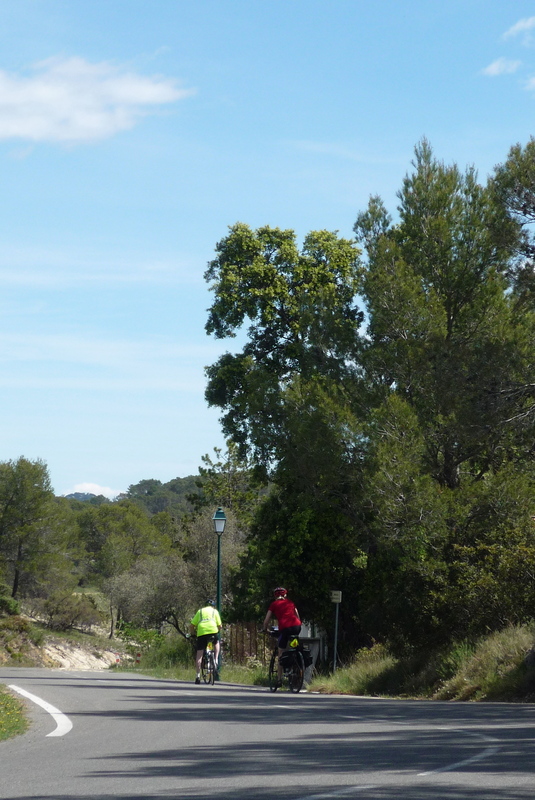 Here is the happy couple riding through the gorgeous countryside of Languedoc. And then it really was goodbye (well, not really. We did meet up again in the next village because I was afraid my directions wouldn’t get them through it unscathed). But after that – Au Revoir! 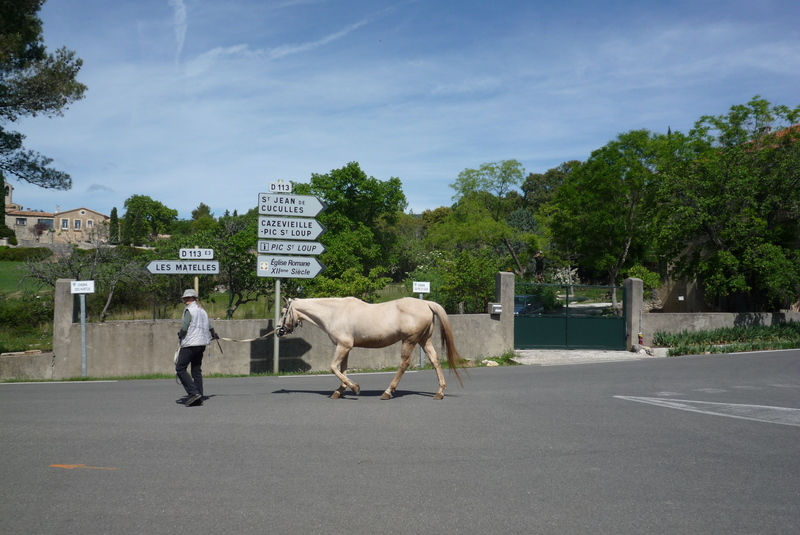 Anne and David are still in St. Guilhem and, with a little luck, my directions will lead them to Villa Roquette, one of my ‘cycling-friendly’ B&Bs, for a couple of nights, then back to their home base of Montpellier and then home to Massachusetts. David and Anne, it was really great to have been able to meet you and bonne route on the rest of your trip! Anne and David’s most excellent bikes were supplied by Village Vélo. They are staying at quaint Le Guilhaume d’Orange in St. Guilhem le Désert. If you’re interested in a self-guided tour in Le Sud, contact me! 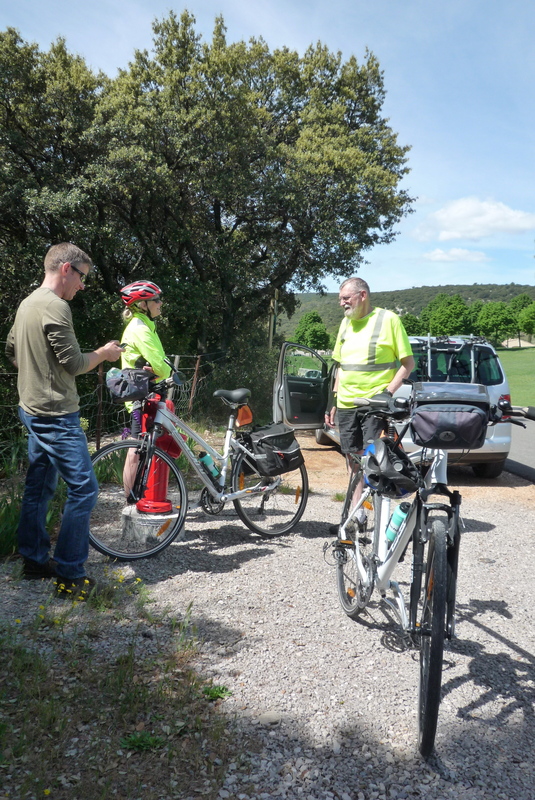 This entry was posted in Cycling, Guided Rides and Tours and tagged cycling languedoc self-guided tour. Bookmark the permalink. find a job you love …..and you never work again right? They are lucky to have worked with you and I’m sure they’ll have a fabulous trip! I had no idea you handle baggage transfers too on top of everything else, sounds like a real job to me! And after all that, with your Sunday post in mind, isn’t it time to return to riding uphill? Oh yes, don’t your photos make me miss France! Thanks, Susan! 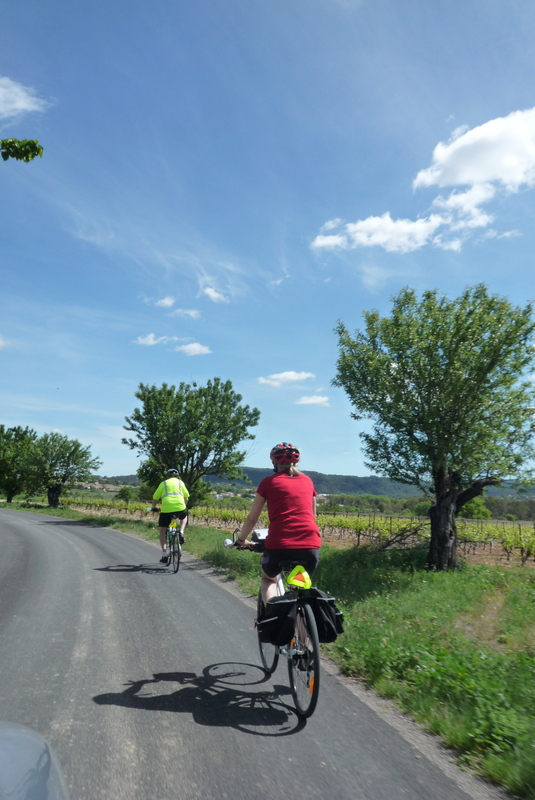 They are now at the B&B and had a fabulous ride through the vines and villages yesterday. Uphill you say…did 1000 meters of hill repeats yesterday. Does that count? The knee isn’t happy, but it’ll get over it. Photos coming! Seriously, I was talking with my wife about another trip to France. We might go next year and I would love to try some classic climbs. I guess it would depend on, well, a whole bunch of things! I’ll email you right away and give you some kind of idea at least.